And I am already wanting to make this again. 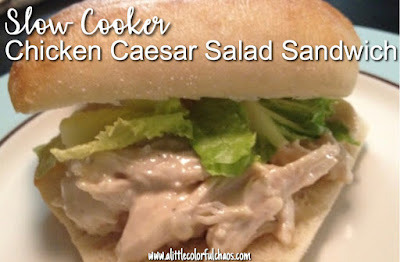 Chicken Caesar Salad...IN THE CROCK POT? OK! I am all for throwing a bunch of food in a pot and letting it cook on its own for hours without me having to touch it. This was SO easy and SO delicious. The recipe makes 4 sandwiches and J and I almost polished it off in one night. Once again, I owe Six Sisters Stuff for what's going to be a new staple in our recipe rotation. 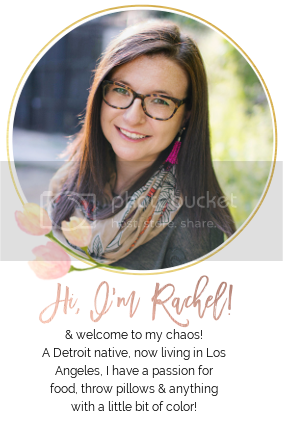 How easy was this for Rachel to make? VERY! Place chicken in a 3-4 quart slow cooker with 2 cups water. Cover and cook on low for 4-6 hours. I did season the chicken just a bit with salt and pepper and removed from the pot after 5 hours. Remove chicken from water and begin to shred. I started with 2 forks and ended up just using my hands to pull the chicken apart. The great thing about shredding chicken yourself is the ability to really trim out the fat. Drain the water from the pot. Return the shredded chicken to the pot. Add in the Caesar dressing, pepper and parmesan. Mix thoroughly. Cover and cook on high heat for 30 minutes. Spoon as much chicken as you'd like onto your bread. Top with lettuce and extra parm if needed. The chicken was awesome warm and it was equally as awesome the next day when we ate it cold. Yum. I'm starting to think it's time to invest in another crockpot. This might have been the best dish my crockpot has made. We just ate these last week and will probably be having them again this week! Made this today and it is so simple and so good!